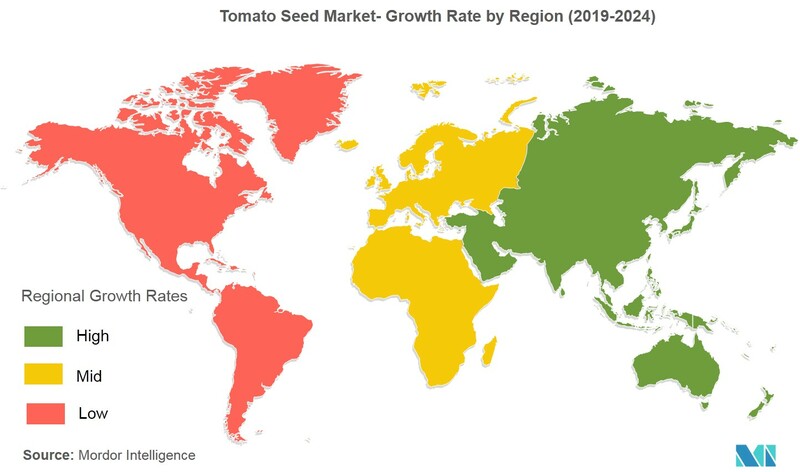 The Global Tomato Seeds Market is Segmented by Geography (North America, Europe, Asia-Pacific, South America, and Africa). 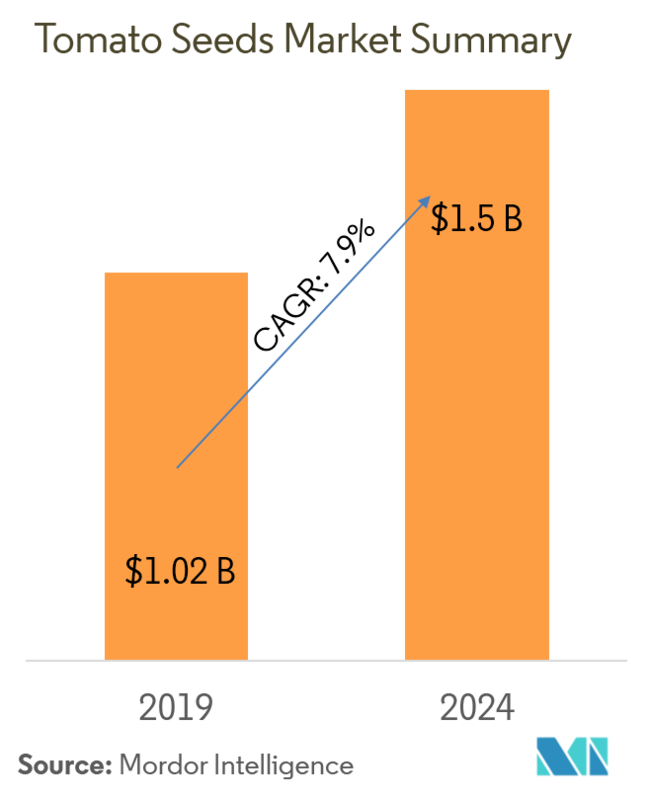 The global tomato seeds market was valued at USD 956.7 million in 2018, and it is expected to register a CAGR of 7.9% during the forecast period (2019-2024). In 2017, North America was the largest geographical segment of the market studied and accounted for a share of around 32.9% of the overall market. The cultivation of tomatoes has been exhibiting an increasing trend, around the world. The production of tomatoes, globally, has increased from 137.0 million metric ton in 2007 to 182.0 million metric ton in 2017, registering a growth of around 72% in production. Rise in overall acreage is encouraging high purchase of tomato seeds by farmers, and thereby supporting the market growth. European countries, like France, the Netherlands, Germany, and the United Kingdom, has high demand for the frozen vegetables. They are the major importers of frozen vegetables from the developing countries. According to the EU agriculture report in 2017, processed tomato consumption is expected to increase from 20.5 kg per capita to 21 kg per capita by 2030. The aforementioned factors are likely to drive the market growth. Tomato is one of the most important vegetable crops, grown extensively in the tropical and sub-tropical climate. Tomato is a major vegetable consumed globally, second only to potatoes. For a broader classification 16 countries have been picked up for this study. The increasing awareness regarding the high nutritional value of vegetables has increased the consumption of vegetables, including tomatoes, in order to meet diverse dietary and nutritional needs. The aforementioned factor has caused a rise in the demand for tomatoes, which in turn, automatically drives the demand for tomato seed. However, due to climate changes, resistance developed by pests, poor infrastructure, and post-harvest loss, there is a need for new high-yielding and hybrid seeds to help the farmers increase the yield. Among all the vegetable seeds, cabbage and tomato account for the highest seed replacement rate, 100% and 99.3%, respectively. Currently, only 20% of the seeds used by the farmers are of good quality, whereas, the remaining 75% of demand is being catered to by the saved seeds of farmers, from the previous season. Rising awareness among farmers about the benefits associated with the adoption of hybrids, especially in the emerging economies, such as India and Brazil, through government support, is accelerating the market. The biotech area is also growing around the world, which leads to an increase in the demand for hybrid tomato seed. According to the International Service for the Acquisition of Agri-biotech Applications (ISAAA), the area under biotech crop production increased from 179.7 million hectares in 2015, to about 189.8 million hectares in 2018. Developing countries accounted for around 53% of the global biotech hectares. According to Mordor Intelligence analysis, the share of the US tomato Seed market in the North American market accounted for 76% in 2018. The area under production is indicating a slight decline in the recent past years, due to the falling export demand, volatile prices, erratic and adverse weather events (such as freezes, rainfall, and hurricane), poor soils conditions in relation to organic matter and pH, and pest and disease pressures. There is more than 95% intensification of tomato hybrids in cultivation across the United States, which makes the country one of the most matured markets for tomato seeds. 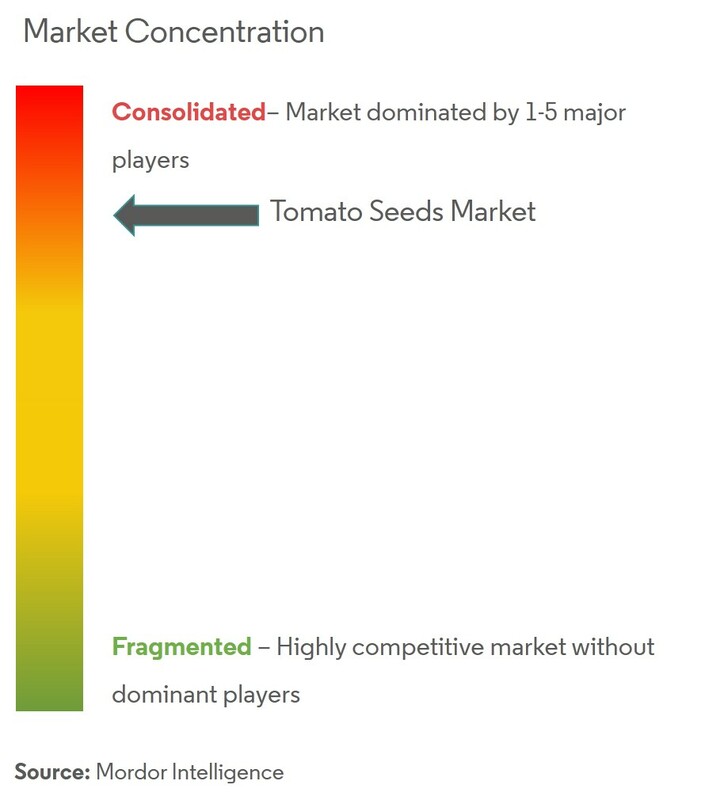 The global tomato seeds market is fairly consolidated with top five players accounting more than 60% of the market share. 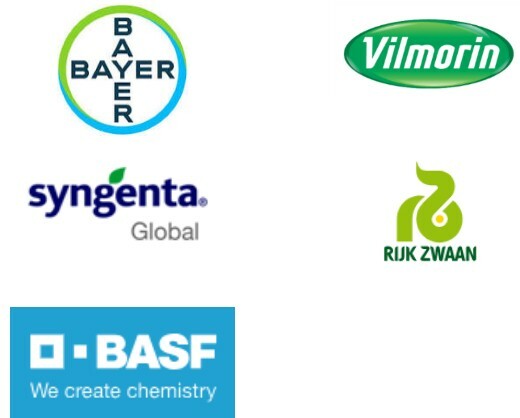 Diversification of portfolios through the development of new varieties is one of the most prominent strategies applied for further intensification in the matured markets. Key players are also expanding their reign globally through R&D cooperation, mergers, acquisitions, and geographical expansions. The greater market share of these players can be attributed to their large geographical presence and highly diversified product portfolio. These players are known to be focusing on R&D, large product portfolio, wide geographical presence, and aggressive acquisition strategy. 6.3.3 Rijk Zwaan Zaadteelt en Zaadhandel B.V.